Mark the date! It’s the end of weekly paper tickets. We’re switching weekly season tickets to Smart Cards from 30 April 2019. When you buy your weekly ticket, we’ll automatically issue a Smart Card. You can get your FREE Smart Card online, simply register here and we’ll send your Smart Card within 3 working days, or if you apply before 10 am you’ll receive it the next business day. Once you’ve got your Smart Card. The Greater Anglia mobile app, plus if you’re an Android user, wait a few minutes after you’ve bought your ticket, hold your Smart Card to the back of your phone and load your ticket there and then. *Smart Cards have replaced paper tickets as the recommended way to buy your weekly season ticket. Weekly paper tickets will only be issued on specific routes, under certain circumstances from 30 April 2019. You can download the Smart Card route map here. You will need to add your photocard number. If you don’t have one, this can be issued free of charge at any staffed station ticket office, just take along a passport-sized photograph. We'll send your personalised Smart Card within three working days. Once you receive your card, log into your online account and purchase or renew your Season Ticket. Please leave at least two hours between purchasing your Season Ticket and collecting it at the station. You can also purchase your season ticket and have it loaded onto your card at any of the stations listed here. Smart Cards can be used for Weekly, Monthly and Annual Season Tickets. 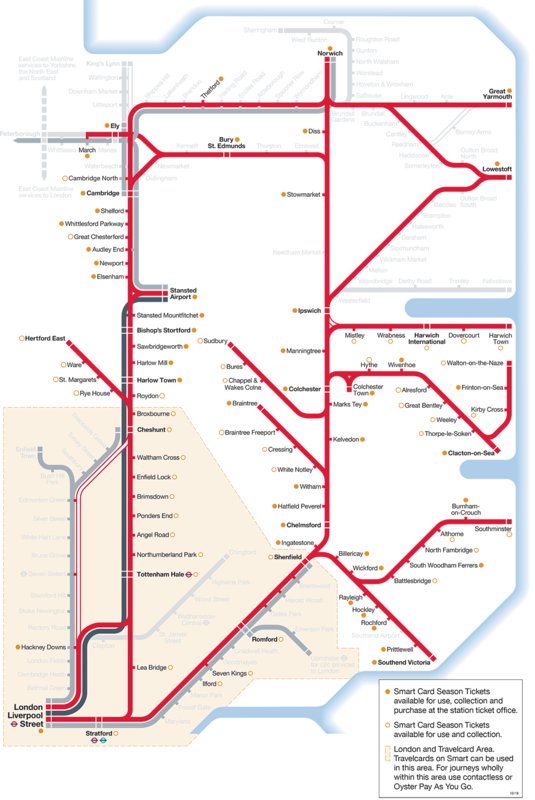 Our route map shows where you can use your Smart Card on the Greater Anglia network and which stations you can collect your Season Tickets from. Where can I purchase my smart season ticket in person? What is the Greater Anglia Smart Card? Greater Anglia’s Smart Card is an electronic, reusable card that is being introduced across our network. It is part of the Department for Transport‘ South East Flexible Ticketing’ scheme, which aims to enable interoperable smart ticketing on all of the train operators across the South East. You can already use your Smart Card on Transport for London services, and eventually you will be able to use it for a variety of train companies and ticket types. Why choose a Smart Card? You’ve told us how frustrating it can be when your paper ticket stops working at the gate, or when the ink fades; we know it’s annoying to have to queue up in the station to get a replacement ticket. You’ve also told us that you’d love to be able to buy your Season Ticket online and be able to pick it up at a time that’s convenient for you. Smart Cards are far more durable than paper tickets – they won’t stop working halfway through the validity of the ticket for some unknown reason, and if you accidentally put them through the wash, they’ll still work. Plus, you’ll be able to manage your account online – no more waiting in the queue at the ticket office, just buy your ticket online and tap at a station to load it onto your Smart Card. Using a Smart Card for your Season Ticket is much quicker. You no longer need to queue at a ticket office to purchase your Season Ticket, simply buy it online at your convenience and then present your card at a gate or ticket machine to load your Season Ticket product to your Smart Card. You must collect your Season Ticket from your chosen collection station before you travel. Please allow a minimum of two hours before collecting your Season Ticket. PlusBus, discounted and Anglia Plus season tickets cannot be issued on Smart Cards. Is a Smart Card the same as Oyster? Not quite. Whilst Oyster is similar in that it is a plastic card that can also hold Season Tickets, unlike Oyster the Greater Anglia Smart Card will not have a ‘Pay As You Go (PAYG)’ feature. Weekly, Monthly, Custom Duration and Annual Season Tickets are available on Smart Cards. You will, however, be able to include a London Travelcard with your Season Ticket on your Smart Card, for travel within London zones, just like you can for a paper Season Ticket. Who can get a Smart Card? The Greater Anglia Smart Card is available to anyone over 16 years of age, who wants to travel using a Weekly, Monthly, Custom Duration (e.g. three months) or Annual Season Ticket on the Norwich, Southend and Cambridge to London routes (for example, Bishop’s Stortford to Cambridge, or Rayleigh to London). We are also offering Travelcard add-ons, so you can buy a ticket to any London zonal combination (for example, Colchester to London Z3-6). Customers with Annual Season Tickets on their Smart Card are entitled to Gold Card benefits, just like a paper ticket. If you're a current Season Ticket holder and you have more than one month's validity on your ticket, you can apply for a Smart Card via our 'Smart Swap' service at selected stations. How do I get my Smart Card? The card will be sent to you within three working days by First Class post to the address specified. What do I do when I receive my card? Simply log in to your account, your Smart Card will automatically be linked to your account. You can then purchase your Season Ticket. How do I buy my Season Ticket? Log in to your account, select where you’re travelling from and to, and how long you need your Season Ticket for. You’ll be asked to state which station you want to collect your Smart Card Season Ticket at. You will need to add your photocard number. If you don’t have one, this can be issued free of charge at any staffed station ticket office. How do I collect my Smart Card Season Ticket? You can collect your Season Ticket two hours after you have purchased it from your chosen station. Your Season Ticket will be loaded onto your Smart Card when you touch into the yellow gateline reader, or tickets can be collected at the ticket machine at stations with no gates. You can collect your Season Ticket in advance using the ticket machine. When purchasing your Season Ticket online you will need to state which station you want to collect your Season Ticket at. Smart Card season tickets must be collected at your chosen collection station before you travel. Smart Card season tickets for travel to and from Inner London stations must be loaded at the ticket gates or the validators before travel. ​Tickets must be loaded at the ticket gate or at the platform validator. Which Season Tickets are available on Smart Cards? How will my Smart Card be inspected during the journey? On board our trains your Smart Card will be checked with a hand held reader. You will also be asked for your National Rail photocard. How do I check my Smart Card on the move? You can download the free mobile app, ECEBS, which can be found on Google Play. What if my Smart Card stops working or is damaged? Our staff will be able to assist in the first instance if your card stops working. If you continue to have problems, please contact our Smart Card Support Team on 0345 600 7245 (option 9) who will be able to assist and rectify the fault. What if I lose my Smart Card, or it’s been stolen? Call our Smart Card Support Team on 0345 600 7245 (option 9) who can cancel it remotely so that it stops working and no one else will be able to use your card. A charge may be applicable for replacement of lost cards. I don’t need my Smart Card anymore. Will I get a refund? Refunds will be calculated in the same way as they are for paper tickets. If the Smart Card holds residual value, and you do not need to travel anymore, you can contact the Smart Card Support team on 0345 600 7245 (option 9) who will be able to process this for you. Do I need a new Smart Card when my ticket expires? No. Smart Cards are fully reusable. Once a ticket expires, simply go online, purchase a new ticket, and load this in the same way as you did initially. The card will never ‘fill up’, as expired tickets will be automatically deleted. Can I board/alight at stations in between where my ticket is valid? Yes, you will be able to board/alight (‘break your journey’) at any station along the route that your ticket is valid on. At some locations with ticket gates, due to ongoing software upgrades, your Smart Card may need to be validated manually by the gateline staff. I am an annual Gold Card holder. Will I still get my Gold Card benefits with a Smart Card? Yes, if you purchase an Annual Season Ticket on a Smart Card, you will automatically be issued with a Gold Record Card. You will receive this by post 5-7 days after purchasing your ticket. This Gold Record Card can be used to obtain all your usual Gold Card benefits. Will I still be able to obtain my 2FOR1 London discounts with my Smart Card? Yes, just show your Smart Card at the attraction to obtain your discount. How long will it take to swap my paper Season Ticket to Smart Card? We aim to honour all requests within ten business days. Customers will receive regular communication once their request has been processed and when the Smart Card is ready for collection. What information do I need to show on collection? Customers are required to bring along their original Season Ticket, National Rail photo card and additional form of ID. What are the participating stations offering Smart Swap? West Route: Cambridge, Audley End, Newport, Elsenham, Stansted Airport, Stansted Mountfitchet, Bishop’s Stortford, Harlow Mill, and Harlow Town. North Route: Norwich, Diss, Stowmarket, Ipswich, Manningtree, Colchester, Colchester Town, Wivenhoe, Frinton-on-Sea, Clacton-on-Sea, Marks Tey, Kelvedon, Braintree, Witham, Hatfield Peverel, Chelmsford, Ingatestone and Liverpool Street. South East Route: Billericay, Wickford, Rayleigh, Hockley, Rochford and Southend Victoria. ​We will aim to increase the participating stations list depending on customer demand.